We get a growing number of emails every day from you, our readers about all sorts of questions concerning real estate. The other day, we got asked this really good set of questions from someone planning to buy a condo as an investment, for the first time. These are really important matters that everyone thinking about starting to invest in properties, should ask. Unless they don’t mind if they lose their hard-earned money. So, we are sharing it all here for everyone to also benefit from it. 1. Is buying a second hand unit a good decision? or RFO or Pre-selling? Pre-selling projects are priced lower than RFO and units in the secondary market since the development hasn’t reached its full potential yet. The room for appreciation in value is still big and longer payment terms are available for the equity. There’s also less leg work required when it comes to the processing of documents of ownership. However, it will take quite some time for your money to actually produce something in return. So your cash will be stuck for a while until the project will be completed. For the RFO, this is the opposite of the pre-selling but the documentation part is the same. Since the project is already up and running, you can already use your unit after completing your obligations (payments & documents required by the developer). However, these are usually a lot more pricey compared to its pre-selling counterpart. This is because the site has already been developed and the property has already appreciated in value. Second hand units (secondary market) are a mixture of both because you can actually buy second hand units while still in pre-selling, when the property owner cannot or will not continue with his unit anymore. The most important consideration in buying this type of unit is the TIME. Strong attention to details will also go a long way. You need more time to do your due diligence, in checking the documents from the owner of the property. Check the payments if they are updated or completed; check the condition of the property, especially if the unit has been occupied already or has existed for some time already. And it can be quite a hassle to process the transfer of ownership from the current owner to you. You have to secure all the legal documents needed for the purchase and the subsequent change of ownership (that is, if you don’t have a competent broker working with you). This is not to discourage you about buying a second hand unit; rather, just a heads up on what to expect; because despite all these hassles and seemingly lots of trouble-kind-of-deal, you have the flexibility in negotiating the price and payment terms with the property owner. 2. Is it preferable to shell out bigger DP? DP or equity is the leverage you use in your investment property. Leverage is when you have something small in amount that you use to take control of something greater. In this sense, a smaller equity can be a good way to go. For example, let’s say you have P1M… Instead of using all that as your DP for buying just 1 condo unit, you can buy 2 units instead with P500k in DP for each. Then you can rent out 2 properties instead of just 1. However, most developers now incentivize buyers who will pay a bigger equity for their property purchase, by giving discounts from the selling price. 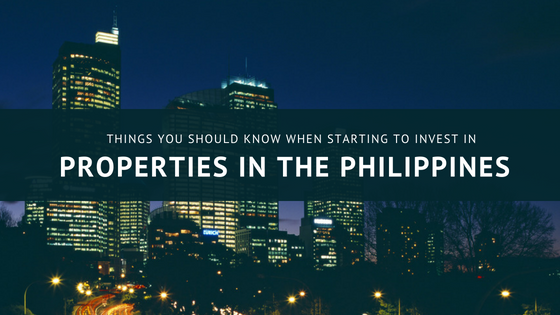 Also, financing institutions here in PH consider the percentage of your equity as a big factor, among other things, in approving your loan application. So you’ll have to weigh things according to your own preferences and risk tolerance. 3. Is it preferable to pay spot DP or installment? Spot payments enable you to enjoy discounts while installment payments will buy you time for your money to be used in other matters. If the property you are buying is pre-selling and it will take longer than a couple of years to complete, I’d say installment payments will be advantageous. This way, you can invest the bulk of your money on other ventures. Some developers may have a combination of these payments example: 10% spot downpayment, 10% in 24 months, 80% lump sum or bank financing. 4. For the balance, is paying in a short term like 2 to 3 years the right thing to do? Or is it better to take the longer terms like 5 to 10 years and let the rental income help pay for the monthly amortizations? There might be periods when my unit has no tenant, but I anticipate this situation already. In the mortgage period, there is no right or wrong in which payment term you want to choose. It actually depends on your source of income, your age and again, risk tolerance. For shorter mortgage terms, you get charged lower interest rates but bigger monthly payments. With this term, you are less prone to volatility of the interest rates. On the other hand, long mortgage terms mean higher interest charges (or rates) but smaller monthly payments. Banks may also offer or require a fixing period, wherein the interest rate will be fixed at a certain period of time regardless of the change of prevailing rate within the fixing period, like a year or two for example. Other institutions allow you to lock in on the interest rate for the entire period of your mortgage. 5. Is it better to let the developer handle the property management or should I handle it personally? If you have the time, skills and knowledge on how to manage your property, it would be a great experience if you will manage your own property. If there’s only one person who has your best interest in mind, it would be yourself. Developers have a lot of their own problems to mind, and units to manage. But if you don’t have the time and capability to manage a property, hire a professional that will have your best interest in mind, it may be a property management company, the developer themselves, or an individual property manager. 6. Another thing of interest is condotel, is it a good investment? Just like any investment, condotels work well for some people but not for others. Each condotel operator has their own investment model. Check out their offers and investment plans, if you think it suits your personal investment plan, then giving it a try should be a good idea. Lastly, I’d like to give you one more bit of advice that you’ll surely find helpful, if you’ve never done it before. It’s about computing your return on investment.